Thus far, we have noted that our ‘菜’ character can mean either vegetable, dish or cuisine, and, in our last post, we looked at an example of it’s employment in the former sense using the common vegetable, Bok Choy. Today, we turn to situations in which菜 is used to refer to a type cuisine and, for a first example, we will look at the famously spicy culinary tradition of China’s western province of Sichuan. So what’s with the introductory pictures of rivers? The second character is one of several Chinese characters that mean river. This one is particularly easy to recognize, not merely because it is so simple in form, but because the three lines very much suggest the flowing lines of a river current. As for the pronunciation, I daresay that anybody who loves Chinese food is well familiar with the name “Sichuan’ and should have no difficulty saying it out loud. You have probably seen the alternate spellings on menus and in cookery books from time to time but the first English spelling ‘Sichuan’ is now to be preferred as it more closely reflects the Pinyin transliteration. We saw this picture in our very first post when you were asked to locate and recognize our ‘菜’ character. As you can see, the sign begins with 四川, or ‘Sichuan’, and then ends with 川菜. From the knowledge you now have, you can probably translate this as ‘River Cuisine’. So… why not ‘Four River Cuisine’? In practice, as it happens, you will encounter the abbreviated form (pronounced Chuān cài) far more often. This restaurant uses the common abbreviated form to announce the type of food available. You will also notice, that not only does it spell out the precise out the English version of the Chinese characters but also translates 菜 as ‘dish’ (in the sense of ‘dishes’) rather than ‘cuisine’. If you think about it, a restaurant could convey the exact same meaning saying ‘We serve Chinese cuisine’ as it could with ‘We serve Chinese dishes’ so, in this context, the two seemingly different translations are actually pretty nearly synonymous. These two restaurants use very stylized ‘grass-claw-tree’ characters for ‘cuisine’. As you can see, one spells the food specialty out in full, while the other uses the single character abbreviation for Sichuan. Just imagine passing by this restaurant and being able to amaze your friends by telling them what sort of cuisine is being served! Anyway, you should now be getting somewhat adept at identifying the ‘THREE FLOWING LINES” plus ‘GRASS-CLAW=TREE’. Eventually, of course, your ability to spot Sichuan cuisine will cease to amaze your friends after a while but, on the bright side, if you do it enough you will be able to relish the sensation of being insufferably annoying! 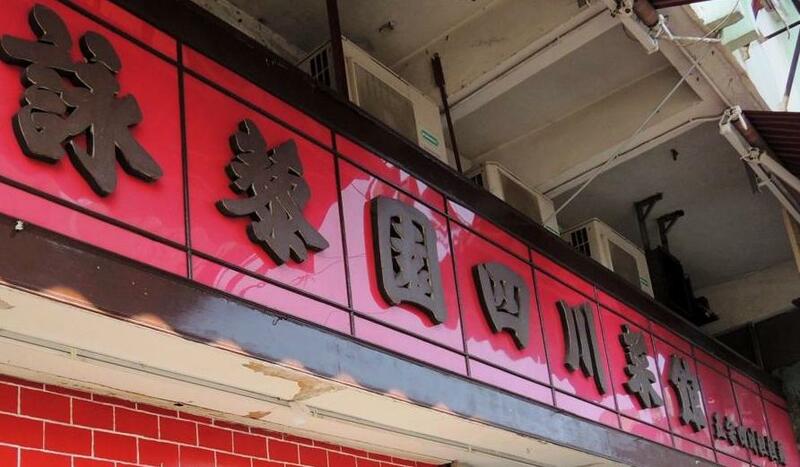 For fun (and extra practice at becoming annoying), I googled Sichuan restaurant sign images and found one with a very unique “font”. Am I correct in reading the three peppers logo as “chuan”? Hah… Very clever! I don’t think I would have noticed that if you hadn’t pointed it out! I admire your tenacity in learning the language. I certainly am enjoying learning the food. Thoroughly enjoyed this lesson! Fascinating to begin being able to pick out just a few of the characters and know what they mean/probably mean. Like it that you gave so many examples as the writing itself varies from one restaurant to the other. I DO wish I felt comfortable with the now correct ‘Sichuan’ – I am afraid I still keyboard the ‘Szechuan’ I have used for so many years 🙂 ! Sichuan seems to be becoming more common but you still see Szechuan all over the place. Hi John I’m catching up on your lessons in Beijing with my Chinese daughter in law helping my translation. She is very impressed with your teaching methods. Is that the sign China Sichuan restaurant in Dublin, Ireland in Example 3?